The 2018 Nathan's Famous Hot Dog competition ended in drama, and a world record. The original count for the men's competition had world champion Joey Chestnut as the winner, but found he'd fallen short of his record of 72 by at least 5 dogs. Turns out the initial count was wrong. ESPN is now reporting that Chestnut has in fact beaten his record, gobbling down 74 dogs. Second-place finisher Carmen Cincotti ate 64. "Electronic counters need to be brought into competitive eating. I love the sport, but today was a massive black eye," ESPN sports business reporter Darren Rovell tweeted about the mistake. Longtime announcer George Shea tells The Associated Press he noticed in real time that jurists measuring Chestnut’s and Cincotti’s intake weren’t counting from two plates stacked with franks that the eaters were drawing from. The under-counted tally was then displayed on live TV. Shea says both Chestnut and Cincotti were adamant about their scores, which were certified by Brooklyn District Attorney Eric Gonzalez. He says new judges will be used next year. Meanwhile, Miki Sudo downed 37 franks to win her fifth straight title in the women’s competition of the annual Nathan’s Famous July Fourth hot dog eating contest. The Las Vegas competitor fell short of the 41 hot dogs she consumed last year but still beat out second-place finisher Michelle Lesco, of Tucson, Arizona. Lesco chowed down 28 wieners and buns. “I just left room for improvement next year," she said. Sudo was a fan favorite, drawing big cheers from the crowd during her performance, which was slightly delayed after she requested new water to soak her buns. The live blog has now ended. Recap on the action below. 1:10 p.m. Wow, the drama has not ended: an ESPN reporter has just tweeted that the counter missed a plate. Apparently 74 is the official count for Chestnut, which is the all-time record! 1:04 p.m. Well, he didn't beat his world record of 72 dogs and buns, but he still won. 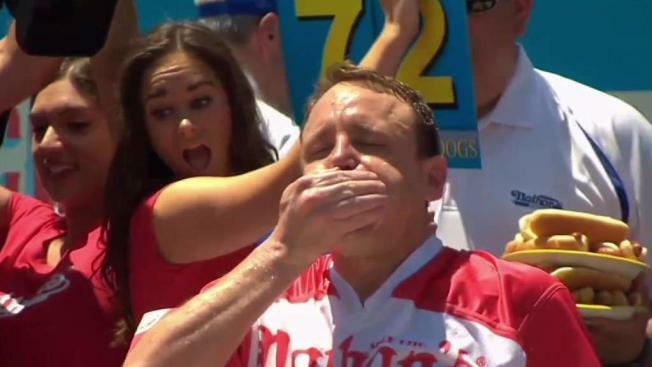 Joey Chestnut is officially the 11-time winner of the Mustard Belt, coming back to destroy the competition after lagging in the first three minutes. The official count hasn't been done, but it looks like he did 64 dogs. What a show. 12:59 p.m. Chestnut has won the contest, yet again! 64 dogs! "We are witnessing athletic mastery...the esophagus of a champion," the commentators crow. 12:57 p.m. "He will sleep the sleep of 1000 martyrs if he can take the comp, yet again." This is sports commentating of the highest quality, thanks ESPN. Chestnut is still ahead. 56 dogs so far. 12:55 p.m. Two dogs, then two buns. Repeat. That seems to be Chestnut's secret here. He's behind his record-setting pace, but he's still well ahead of the pack. 48 dogs so far. Can he still beat his 72 dog record? 12:54 p.m. And Chestnut is back in the lead. What a comeback! He's picked up the pace to overtake Stonie 40 dogs to Stonie's 28. I'm on the edge of my seat. 12:52 p.m. Matthew "Megatoad" Kai Stonie is from California. He shot to YouTube fame when he uploaded a video in 2012 in which he drinks a gallon of Gatorade in 37 seconds. He's now ahead by 4 dogs. 12:50 p.m. Matt Stonie is going dog-to-dog with reigning champ Joey Chestnut. In fact, he's pulled ahead by one dog. Could this be an upset? 12:49 p.m. And we're away! Chestnut is ahead by a dog. 12:45 p.m. Just announced, Carmen Cincotti of New Jersey. He was second to Joey Chestnut last year and today is his birthday, so he's coming for his present. "Bitter rage has driven him for 364 days," the announcer says. 12:42 p.m. Woah, New York rapper and competitive eater Eric Booker aka Badlands just dropped a rhyme on his way to the stage! Plus he's the pea-eating champion of the world! These competitors are extremely multi-talented. 12:39 p.m. There are a surprising number of I.T. professionals in this competition, we're learning from the introductions. Just introduced: Gideon Oji,the kale-eating champion of the world, and also the world's tallest competitive eater, so they say. 12:35 p.m. "The difficulty in his marriage began when he named his children Mild, Medium and Hot..." The competitors are being announced onto the stage in dramatic fashion. Apparently the watermelon-eating champion of the world also holds the pork rind title. Who knew? 12:30 p.m. It's about to begin. The moment we've all been waiting for. Side note: an employee at "The New York Times" named Carmen Cincotti, from New Jersey, is competing. He's a software engineer by day, competitive eater in his spare time. 12:19 p.m. The ten-minute countdown clock will start at 12:30 p.m! In the meantime -- did you know that Joey Chestnut grew up in a family of six kids? He broke onto the scene of competitive eating in 2005, winning a deep-fried asparagus competition. 12:08 a.m. Speaking in a pre-contest interview Joey Chestnut acknowledges it's hot out there, but at least it'll keep the dogs warm. “I can’t be lazy, I’m just going to have fun," he says. He's going for his 11th Mustard Belt. 12:04 a.m. We're waiting for the men's contest to kick off in about 20 minutes. Will Joey “Jaws” Chestnut be able to keep up with his own world record of 72 dogs and buns in 10 minutes? 11:33 a.m. Sudo downed 41 dogs last year, and just 37 this year, but she said she still felt good. She was watching her competitors and could see she had a comfortable lead: “I just left room for improvement next year," she said. 11:31 a.m. Sudo has won $10,000 for her efforts. She was a whopping nine dogs ahead of the competition, and scoffed 37 franks and buns in total. It's not as much as she's done before, but it was enough to take her fifth title. In second place, with 28 dogs and buns was the oyster eating champion of Ireland Michelle Lesko. World record-holder Sonya Thomas took third at 26. 11:21 a.m. Miki Sudo is the runaway winner! She's secured her place as a five time champion at Nathan's. "Absolutely a comfortable win," commentators say. 11:17 a.m. The women's competition is underway with Miki Sudo in first place so far, about 7 dogs ahead of the pack. Sudo is the reigning champ, but does not hold the world record.